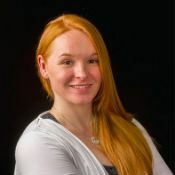 Yoga teachers frequently talk about stretching the hamstrings, and more recently, strengthening them. In stark contrast, the lower leg muscles—and the calves in particular—aren’t addressed nearly as much. I think the calves deserve much more attention than they receive. “Why?” you may ask. Well, for one, releasing tension in the calves can help relieve foot pain from conditions such as plantar fasciitis, as well as reduce knee pain and stiffness. I often neglect pampering my calves and then later regret it—especially when I return to my calf-releasing practice, which reminds me what I’ve been missing. I have strong legs, tight calves, and a decent amount of knee flexion available to me, and when I give my calves the love they deserve, my legs approach the world in an entirely different way. I’m better able to ground my heels, which facilitates a new relationship with standing poses. And the deeper knee flexion allowed by more open calves makes bent-knee asanas such as warrior I and malasana more attainable. There are two calf muscles—the gastrocnemius (which flexes the knee while walking) and the soleus (the primary ankle-flexing muscle)—and each needs to be stretched differently. The gastrocnemius attaches from the lateral and medial condyles of the femur (thighbone) to the Achilles tendon (which is behind the ankle and attaches to the heel bone). In order to stretch the gastroc, the leg must be straight (i.e., no bend in the knee) so that the attachment and insertion points can move away from each other. The origin of the soleus spans across the upper third of the posterior shaft of the fibula (the smaller, thinner shinbone) to the middle third of the medial border of the tibial shaft (the tibia being the other, thicker shinbone). It then merges with the fibers of the gastrocnemius to form the Achilles tendon, which attaches to the calcaneus (heel bone). 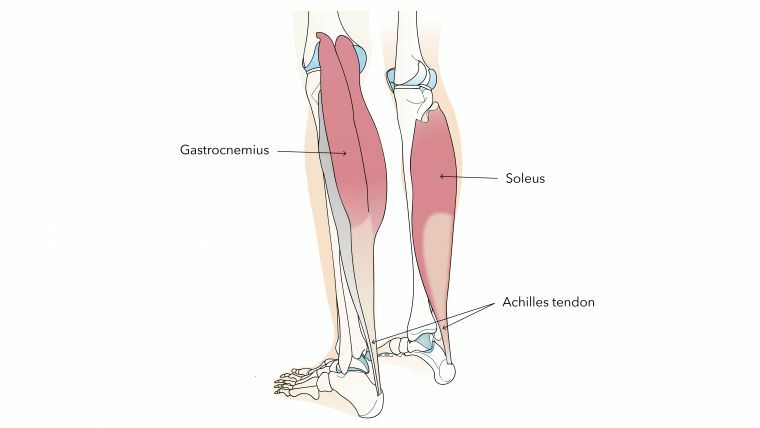 To isolate the soleus from the gastrocnemius while stretching, bend your knee so that the gastroc gets some slack, and then reach your heel away from your calf. The following five techniques are my go-tos for releasing the calves. They can be practiced together as a sequence or sprinkled into your regular asana routine, one at a time. You will need a yoga mat, a blanket, a wall, a folding chair, and two blocks. Therapy balls and an extra rolled-up mat are optional. Roll up your blanket until it is about three to four inches in diameter. (If you have a thicker blanket, do not roll it up all the way. You can also use a rolled-up mat; in most cases the mat can be rolled up entirely.) Start in tabletop with your knees together or hip width apart and the tops of your feet flat on the floor, feet in line with your knees. Snug your blanket roll into your knee creases, and then sit as close to your heels as you can. If this is too intense, you can place your hands on the seat of a chair or on blocks in front of you, or you can place a block under your buttocks at any height that suits you. If you need more height, you can sit on two blocks or a bolster. As you sit upright (and for some this may not happen right away), notice the pressure on the tops of your calves from the blanket roll. You will also probably feel pressure on your hamstrings. To increase the sensation, you can use a denser object such as therapy balls. Rock from side to side, noticing where you feel knots and tightness in the muscles, using the motion to massage out your calves. (The hamstring massage is a bonus!) Then come to stillness. Remain here anywhere from 30 seconds to one minute. Then lean forward, move the prop down the calves an inch, and repeat. Continue in this manner, moving the prop all the way down the calves until you reach your heels. When you’re done, take a moment to sit in vajrasana (thunderbolt pose) and become aware of the space behind your knees and the release of tension in your calves. This is more of an active stretch for the calves and a good precursor to the stretches that follow. Stand about a foot away from the wall with your hands on the wall wider than your shoulders, as if you were going to do a push-up. Place the ball of your right foot on the wall and keep that heel firmly grounded. Slowly bend your elbows and lean into the wall, noticing the sensation in your right calf. Don’t go too far too quickly, being particularly aware of the sensation in the front of your ankle as it comes into greater dorsiflexion (flexed-foot position). Hold for 15 to 30 seconds. Straighten your arms and come back to your starting position. With the ball of your right foot still on the wall, now bend your right knee as you bend your elbows and lean into the wall. This bent-knee variation targets the soleus. Hold for 15 to 30 seconds. Straighten your arms, return to your starting position, and switch sides. You can also repeat multiple times on each side before switching sides. This take on uttanasana helps to stretch the entire backside of the body while focusing on both the gastrocnemius and the soleus. Start with a rolled-up blanket placed at the top of your mat and two blocks at their highest setting (or a chair) about a foot in front of the blanket. Step the ball of your right foot onto the blanket while pressing your right heel into the ground such that the arch of your foot is supported by the blanket. Then do the same with your left foot, so that the balls of both feet are on the blanket and both heels are on the ground. Bend your knees, fold forward from your hips, and place your hands on the blocks (or chair). Ground your heels and straighten your legs (remember, the legs must be straight to target the gastrocnemius muscles). If this is difficult, instead of bending your knees to make it easier, bring your hands up to a higher height. In this case, it would be advantageous to be in a half forward bend for this stretch. Imagine that your calves are a waterslide and that your awareness is sliding down from the attachments to the origins of your gastrocnemius muscles. Hold for 30 seconds. Now bend your knees to release the soleus muscles. Hold for 30 seconds. Continue to alternate stretches two or three more times. This is the most intense calf stretch thus far—so if you’re close to your limit, you may want to skip this one. 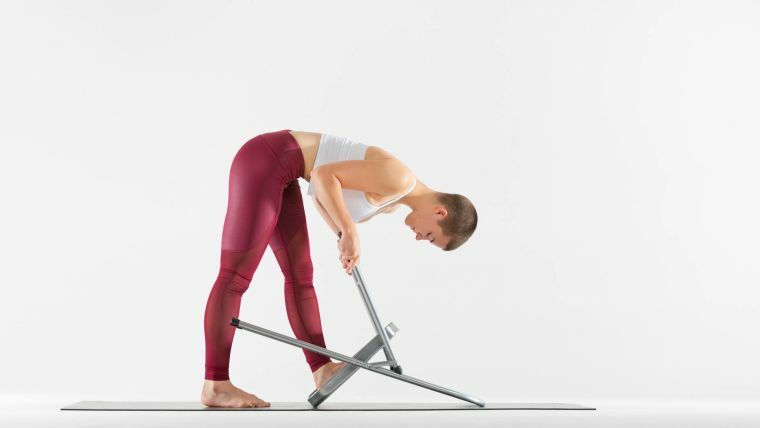 Place your folding chair upside down on your mat so that the bucket (underside) and legs of the chair face you and the seat faces the floor. If the bucket is slippery, place another mat there or fold your mat to cover it. If you choose the latter option, make sure the entire chair is still on the mat. As you inhale lengthen your spine, and as you exhale fold a bit deeper at the hips and bend your elbows for comfort. Hold here for 30 seconds. Then, if you choose to go deeper, walk your hands down the legs of the chair. Continue to walk your hands down the chair legs, pausing, breathing, and repeating until you have not quite reached your edge. When you’ve gone as far as you can sustainably hold, remain there for up to three minutes. To come out of the stretch, walk your hands back up the chair legs. Slowly step away from the chair one foot at a time and come to stand in ardha uttanasana (half standing forward fold). Then slowly come all the way up and stand in mountain pose for a minute or longer to observe the connection between your feet and the floor. Notice whether you feel a newfound sense of ease and steadiness while standing. This one requires a bit of finessing with props. But once you are set up you will be able to stay in this supported version of trikonasana (triangle pose) for quite a while. 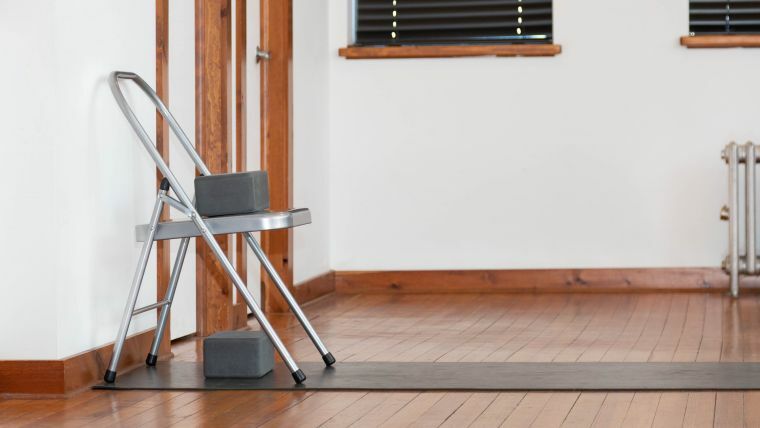 Position the short edge of your mat against the wall and place your chair on it with the seat facing away from the wall. Place one block horizontally on its lowest setting, approximately under the middle of the seat. Have the other block within reach. Stand in mountain pose facing the seat. Take a big step back with your left foot. Place your hands on the seat and the ball of your right foot on the block under the chair. Bend your right knee a little and wedge the other block (on its highest setting) between your right calf and the floor. Angle your left foot in a little and keep your entire left leg firm. Place your right hand on the chair seat and place your left hand on your hip or lift your left arm up toward the ceiling. Turn your chest toward the side wall. Now, straighten your right leg by pressing the calf into the block while simultaneously pressing your right heel into the floor. Imagine that your calf is taffy and that you’re pulling that sticky candy from the center out to the sides. Stay here for about a minute. To come out of the pose, lower your left hand to your hip if it's lifted, bend your right knee, and step your left foot in closer. Root into your feet to lift your torso upright, and then turn your right leg in, placing your right foot back on the ground. Step your feet together and switch sides. The calves are a powerful set of muscles that often don’t get enough attention. This sequence can help to relieve muscular tension through massage, pressure, movement, and stretching. Whether you do the entire sequence or just one stretch, I suspect you will almost immediately feel a difference in how you stand—and how that changes your entire body dynamic in your asana practice. You can purchase the Rad Rounds therapy balls here.